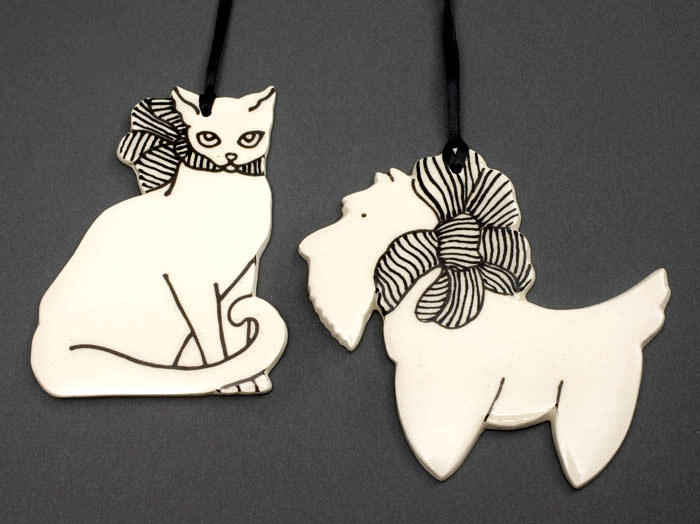 Arts and Crafts Tiles with a Modern Twist will be held over two weekends at McRae Art Studios, 1000 Arlington St., Orlando FL, 32805. April 21 and 22 and May 5 and 6. We will meet from 10 am to 3 pm each day with a one hour break for lunch. We will spend the first weekend creating tiles from wet clay with lots of patterns to work from or you may design your own. I'll cover multiple techniques and you will have plenty of time to practice each one. All written instructions will be included in your class fee. The second weekend will be spent glazing and discussing various decorating techniques that can be translated to regular pottery forms. All the tiles will be fired over the following week and available for pick up by May 12, or I can mail them to you for a small fee. The class fee is $195. That includes all your materials and firing. You may bring a bag lunch or we have a list of restaurants that will deliver as well as Uber Eats. We are also compiling a list of local hotels if you are coming from out of town. Text, email or call me to sign up. I have room for ten students with 3 filled already. Let me know as soon as possible if you wish to attend. Thanks. 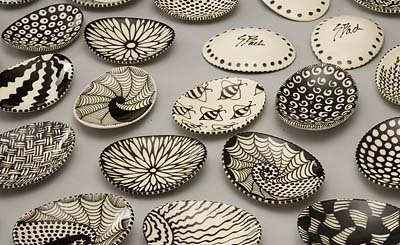 Born and raised in upstate New York, Susan Bach is the daughter of eminent wildlife artist, Tom Beecham. This factor combined with growing up in the beautiful NY countryside has had a major influence on Ms. Bach's work and choice of subject matter today. 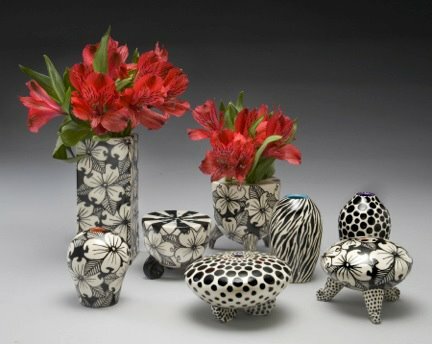 Working with a traditional craftsman's material, clay, in a non traditional way, Ms. Bach creates highly patterned, decorative vessels and sculptures. 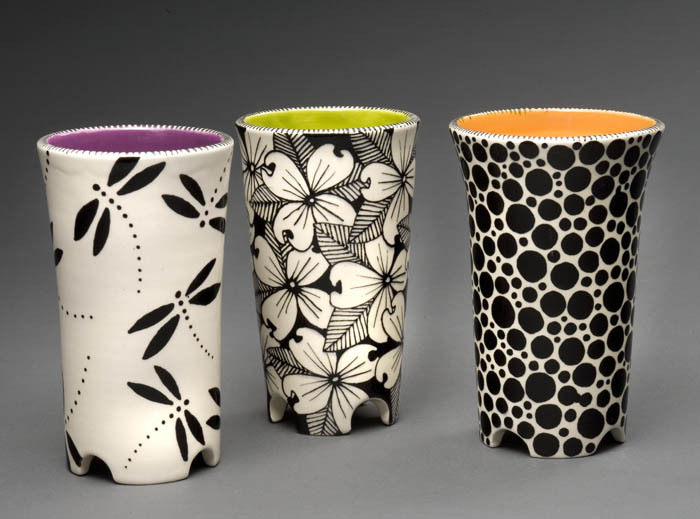 Each piece is fashioned from white earthenware or terra cotta and finished with lustrous glazes. Occasionally, over glaze transfers or 22K gold leaf is added to complete the work. Every piece is original and one-of-a-kind. Ms. Bach has exhibited in galleries, museums and art exhibitions throughout the country. Her work is in many private and corporate collections as well as the permanent collections of the City of Orlando, Valencia Community College and the Maitland Art Center. Ms. Bach teaches private hand building and wheel classes at McRae Art Studios as well as classes in hand building, surface design and mold making at The Pottery Studio, www.cityoforlando.net/pottery and at the Maitland Art Center, www.maitlandartcenter.org. Ms. Bach has been a resident of Orlando, Florida for 35 years. She and her husband, landscape and mural artist Stephen Bach, both attended Pratt Institute in Brooklyn NY. They maintain studios at The McRae Art Studios in Winter Park and at their home in Downtown Orlando's Lake Cherokee Historic District. They live with their 22 year old daughter, two cats and five goldfish.